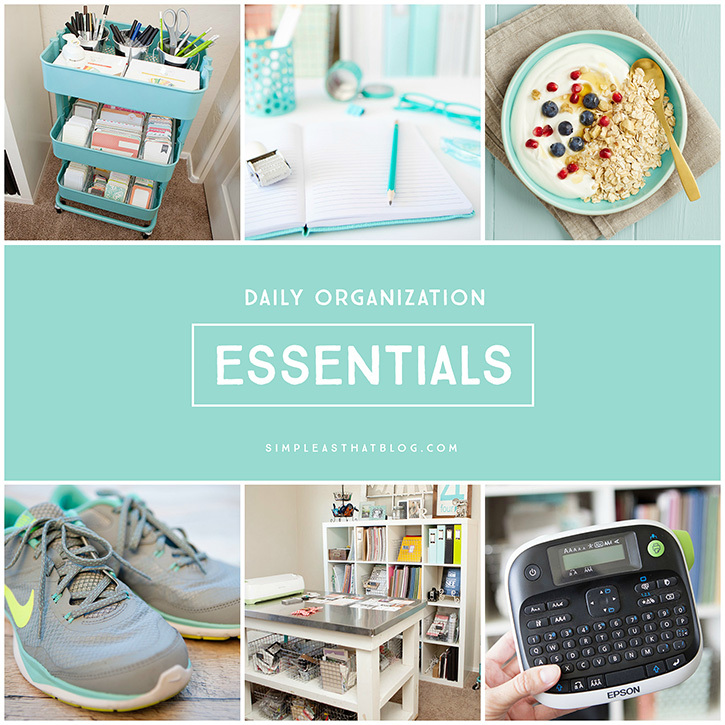 Daily Organization Essentials – when it comes to organizing my days, there are a few things I use over and over again to keep me on top of things. 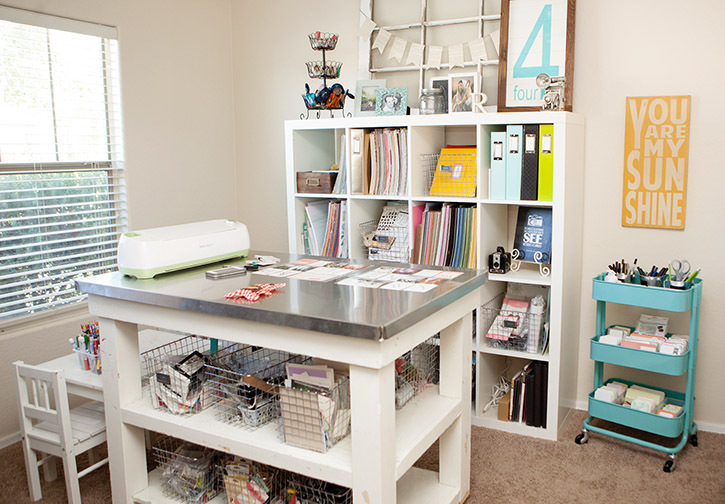 As a wife, mother, and work-at-home creative, I know staying organized is essential. An organized day leads to an organized week, which leads to an organized life. Like any woman trying to keep several plates spinning, I’m not organized all of the time. 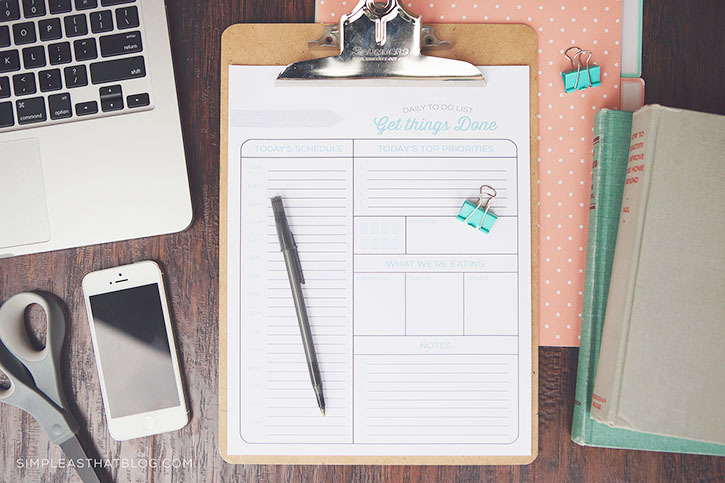 My house gets messy, my sink is full of dishes on any given weeknight, and the laundry piles up, but I do know how I feel when I try to keep things organized and that’s why I continue trying. 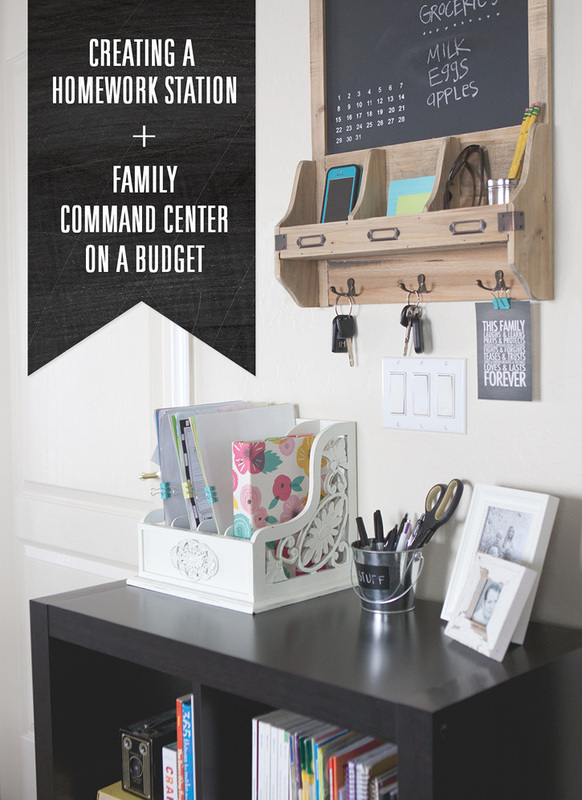 When our family’s belongings and schedules are organized, home becomes an escape from stress and a space that fosters connection and creativity. Peace around me (as opposed to clutter surrounding me) gives me peace of mind. Today I wanted to share a list of supplies that I use daily and re-purchase often to keep our home and my life in order. The organizing essentials I couldn’t function without. 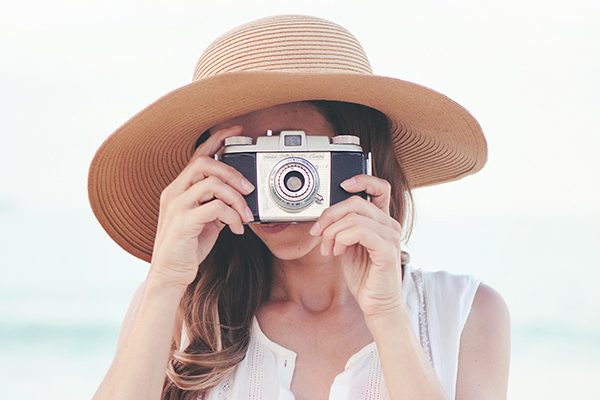 At the end of the post, I’d love to hear what items you couldn’t live without! As much as I love technology, I’m a paper girl at heart. I find so much satisfaction in writing down to-do lists, mapping out my day, jotting down notes and crossing things off as they get done! I needed something to help me stay productive so I designed this system of organizational printables. 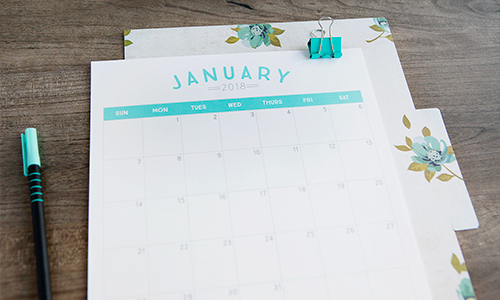 There is a weekly planner, a daily to-do list and schedule, a meal planner, and a 2016 calendar and you can download them all for free here. They’re in my favorite color and are full of white space making them extremely printer friendly. With a background in art, it’s no surprise I’m picky about my pens and paper. I write in my planner and jot notes in down daily, and to do that, I need a good set of pens. 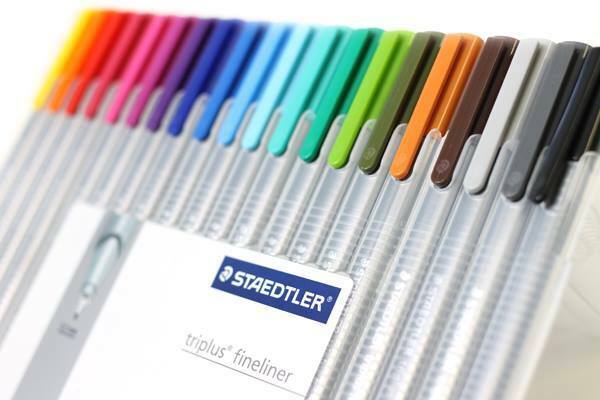 These Staedler Fine liner Pens are my current favorites. I also have this Le Pen set from Marvy Uchida and love them. In my planner I write recurring appointments and commitments in pen, but the rest I record in pencil. I just ordered these pencils because I love the color, so we’ll see how they do. I also love these Staedler WOPEX pencils. Dates and times can change frequently and I like being able to erase so that my planner stays neat and tidy. My label maker is something that gets used often in our home. 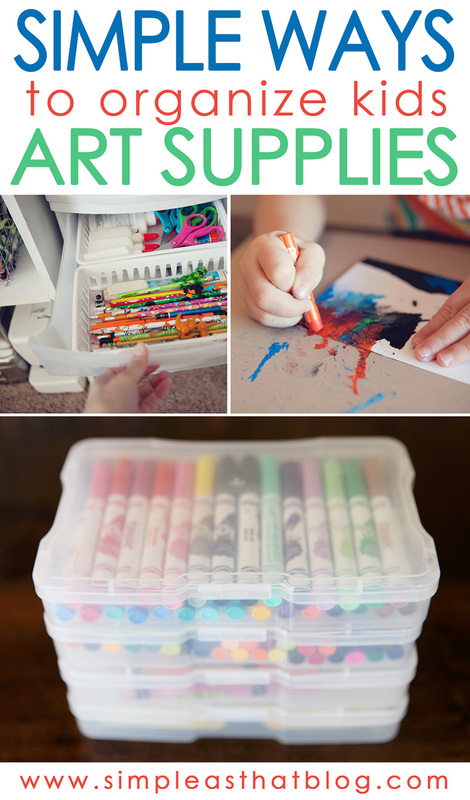 I use it to label containers in our pantry, kids craft supplies, school supplies. You name it – we label it! 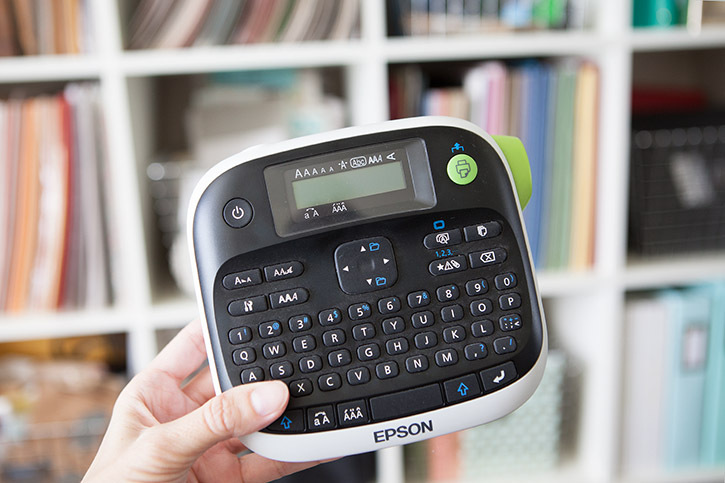 I have this cute Epson LabelWorks Label Maker and it’s worked great for us. It’s perfect for creating professional-looking labels around our home. I love containers and storage solutions. 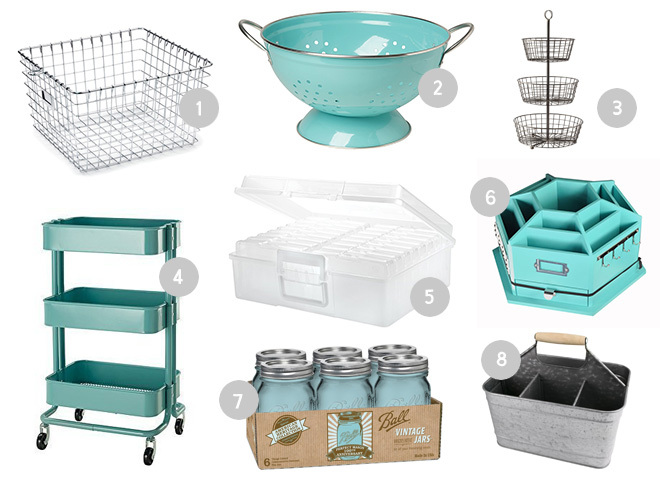 My husband tends not to be as thrilled about these purchases as I am, but even he can agree that everything having a set place is essential in our home. We’re in a small rental at the moment, and I have to keep things in their designated space or things get cluttered quickly. We have places for homework supplies, for kids school papers and artwork. I am a bit of a notebook collector. I use them all the time for jotting down inspiration, I keep them in my purse, and there’s always one out when I’m working on my to-do lists. I love cute notebooks like these from My Minds eye but I also keep a well stocked supply of these for scratch pads by the phone, etc. I also use these Kraft Brown soft cover notebooks for jotting down to-do’s and other miscellaneous thoughts. My phone is essential for keeping me organized. The timer on my phone is also something I use constantly throughout the day.I have a series of alarms that help keep me on track throughout the day. 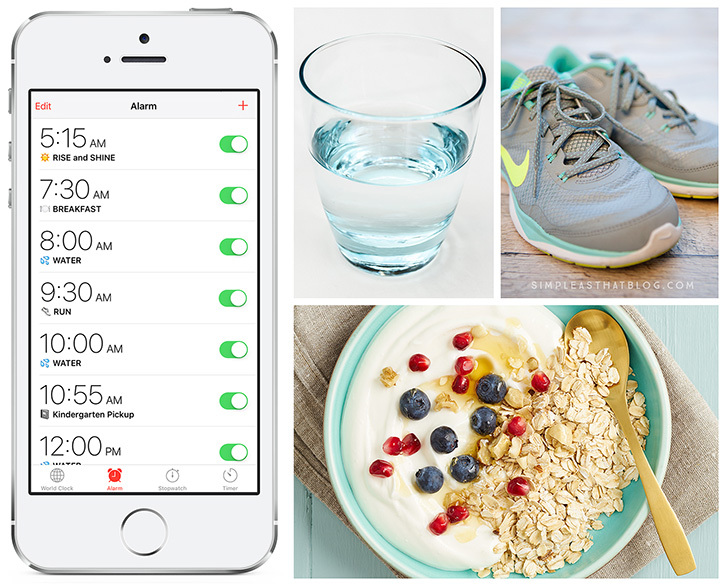 Reminders to eat a healthy breakfast, drink water or go for a run. 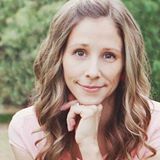 I also learned an amazing tip from my friend Crystal Wilkerson when it comes to staying productive: 20-minutes tasks. 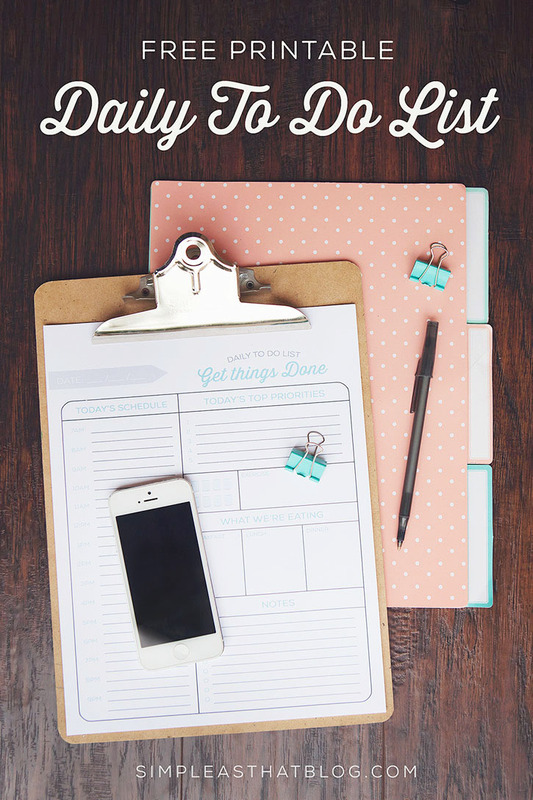 I have an ongoing list of to-do’s in my planner that includes tasks that I can get done in a short period of time. When I find these little windows of time I set my timer, get to work and get it done! I also use the timer to help me stay on task. It’s so easy to get distracted on social media or by anything that seems like a more immediate need. I’ll set it for 20 minutes, get done what I can in that amount of time, and move on to something else after that. On occasion, I get so engrossed in a task that I actually need the timer to remind me to come up for air and evaluate what else is happening around me. 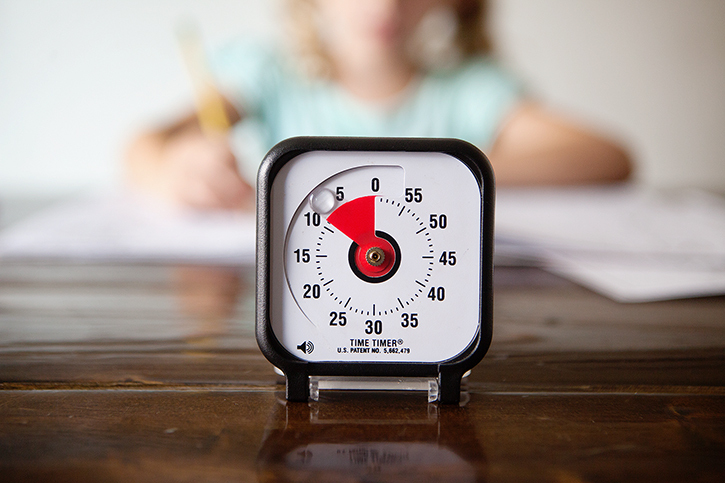 By setting this 20-minute timer, I’m reminded to stop, take a break, grab a drink of water, and attend to other needs around the home and with our family. I don’t just use a timer for me! This simple tool that has done so much to improve my children’s ability to focus and take responsibility for their activities. 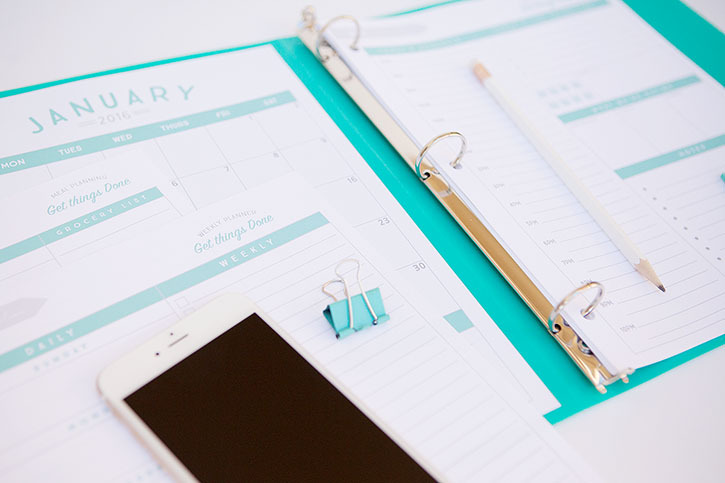 A collection of favorite organizing essentials wouldn’t be complete without my other greatest secrets to staying organized: strategy and consistency. 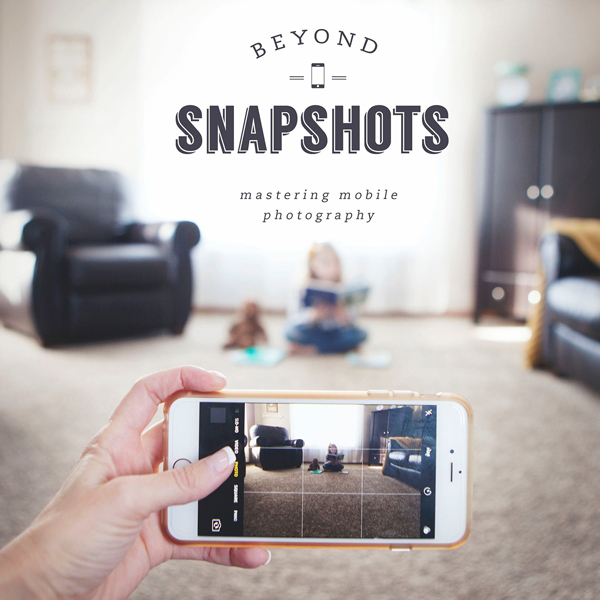 It takes a lot of trial and error to uncover systems that help keep your days in check. But I’ve found that by trying things and taking detailed mental notes on what really works for us, I’ve slowly arrived at systems that make life feel simpler and leave more room for joy. And then by staying loyal to those systems—by using them consistently—I’ve come to find even more room in my life for that joy. I hope you’re finding it too. What supplies are essential to keeping your life in order? My daughter took me to IKEA for the first time on New Year’s Eve. 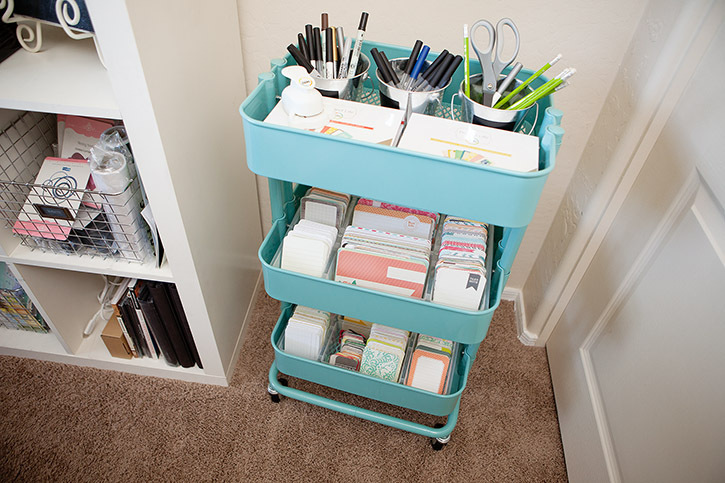 I bought that same cart there in the same color for $29 and LOVE it! My husband even loves it and that’s saying something. I use it for my son’s school books when we homeschool. So much easier to keep everything together. I see a few more things I’m going to have to check out in your list. Thanks for sharing! It’s SO great isn’t it Southern Gal!? Love reading about all your favorites! Thank you. There are a few links I think are missing that I wanted to check out – the pencils and the MME notebooks? I think it’s hysterical that you said your husband doesn’t love all those organizational containers are much as you do. Thanks! I think my husband feels the same way. I was wondering where you got your White Island with the stainless top? I love it. It was a garage sale find Leann – we had someone add the stainless top to it though. Do you have the link for the notebooks? Thanks! How did you know I needed this?? My desk is a disaster area! Going to get it in ship-shape today! I need some major help with our mail system. I feel like we have tried it all still end up with a pile of bills and documents that never get filed. I think I need someone to come in and MAKE it organized so that I can keep it going. I have been using your printable sheets this past month and I have loved how they have influenced my life for the better, thank you!!! I share them with everyone I know. I would be interested in learning about your systems. I’m always eager to learn what others do so I can improve what I’m doing.